Above is a photo of Paul McCartney being served champagne in first class on The Beatles’ flight from London to Tokyo in June 1966. The photo was taken by Robert Whitaker who travelled with The Beatles as their photographer in the 1960s. I don’t normally post things unrelated to my own photography on my site, but since uploading the above photo to my personal Facebook page and receiving so much interest, I thought it might make a good story. 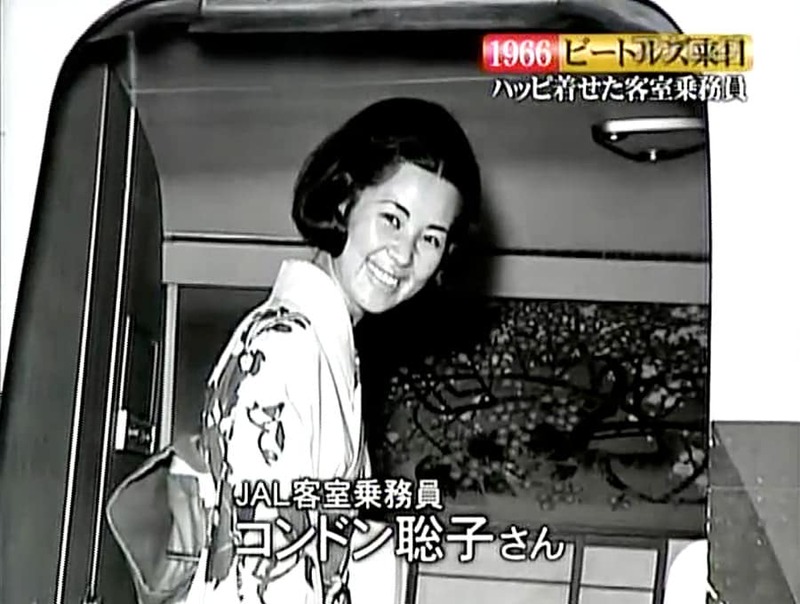 At the time my mother Kawasaki Satoko was a stewardess for Japan Airlines. When news hit that The Beatles were to come to Tokyo for a concert in 1966, she knew she had to be on that flight. However, the crew had already been decided months before, so in order for her to be part of the historic flight, she had to prove that her presence there was invaluable, and got in touch with the JAL PR department to see what could be done. Her contact in the PR department at the time was a man named Itou san, who had come up with an ambitious marketing stunt that could give JAL a much needed publicity boost. He decided that if The Beatles would somehow be wearing the JAL ‘Happi Coats’ (a kind of casual summer over garment worn by Japanese) as they disembarked the plane, the JAL brand would be broadcast to millions of fans around the world and become synonymous with The Beatles, thus becoming the greatest (free) advertising in aviation history. My mum had no other choice but to declare that she would do her best to make it happen! Needless to say, rosters were changed and Satoko Kawasaki was in charge of the First Class cabin which was to house the Beatles for their voyage from London to Tokyo on June 27, 1966. It was here at the Anchorage airport in Alaska that my mum boarded the plane to meet the exhausted Beatles who had been kept awake all night at their hotel by legions of screaming fans yelling their names. Since the flight’s detour had been unplanned, The Beatles had been in the same clothing for the entire journey, unable to retrieve their luggage which was kept onboard the plane. During the flight to Tokyo, John Lennon asked my mother whether she’d be able to iron his suit jacket, since it was so creased and he was quite worried about his appearance when disembarking the plane and seeing his Japanese fans for the first time. Mum had a go at getting the creases out, but decided that this was the perfect opportunity to suggest the Happi Coats. She told John that if he, Ringo, Paul and George were to wear the Happis, not only would they be able to hide their creased attire, but moreover, the Japanese fans would be absolutely delighted to see them in something so traditionally Japanese. According to my mother, John was the friendliest of the group on the day, and he eagerly agreed, handing the Happis out to the rest of The Beatles. Meanwhile, The Beatles’ manager Brian Epstein was not amused. Brand placement such as this was potentially worth millions, and JAL was about to get away with it for free! Indeed, in the photos of The Beatles disembarking the plane for the first time he is clearly visible looking rather annoyed! As a thank you, JAL gave mum a much coveted ticket to The Beatles concert at the Budokan the following night. According to her, this was the first time that she really felt like a true fan of The Beatles – while she was serving them on the plane, they were just her guests in first class and she was just their stewardess. Each year in Japan in June, the NHK broadcasts the famous clip of The Beatles getting off the plane at Haneda Airport. No doubt, each year the JAL PR department high fives each other too, as The Beatles can be seen once again wearing the JAL emblazoned clothing. As John, Paul, Ringo and George walk down the steps onto Japanese soil for the very first time, there’s my mum shaking each one of their hands. Here’s a video which shows that moment, including a short NHK interview with my mother to which I’ve tried to add English subtitles. Before they reached Japan, mum was able to ask The Beatles to sign a photo she had of them. This is still on the wall at home – a frozen moment in time from a bygone era where four men from England were the most famous people in the world.